The Fae Yule World Event is filled with a whole bunch of quests separated into three phases. Each phase has 1 story quest that rewards a Dark Ice Bell and 10x Dark Icicles currency, as well as a variety of daily quests that reward Unique Snowflakes currency. 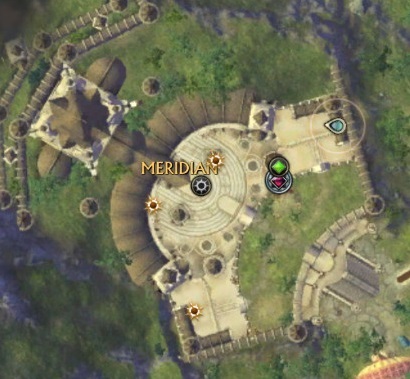 The quest hub for Meridian can be found right outside the main fort in the mid-section between Meridian’s inner and outer walls. Ghar Station Mem at /setwaypoint 4040, 6615 in Goboro Reef. Faelight Sparkle Returns Quest, which is available during all three phases and rewards Tier 3 gear. Nightmare Tide Quests, which are available during all three phases. Phase 1: Remembering the Yulemother quests. Phase 2: Reclaiming Fae Yule quests. Phase 3: Fae Yule Celebration quests. Some of the dailies for previous phases are available in later phases. Questgiver: Stuttk Fyrirthig in Flargle Plaza, Draumheim at /setwaypoint 5623 5453. Reward: Faelight Sparkling Shard of Wonder. First up, collect the ‘Faelight Sparkle Returns’ quest from Stuttk Fyrirthig at either /setwaypoint 5623 5452 in Flargle Plaza, Draumheim, or amongst the Nightmare Tide questgivers in Tempest Bay. Stuttk Fyrirthig is one of the PvP Weekly NPCs. The quest became available after Patch 3.5 so you didn’t have to wait for Fae Yule to begin officially. You must collect 500 Faelight Sparkles. 6x from Random Level 65 Warfront Win if you used up a daily Random charge. 2x from Random Level 65 Warfront Win if don’t have any Random charges left. 6x from Random Level 65 Expert Dungeon if you used up a daily Random charge. 2x from Random Level 65 Expert Dungeon if don’t have any Random charges left. “Spirit of Adventure” Weekly Instant Adventure quest. “Five If By Sea” Weekly NT Zone Event quest. “Cerebral Catharsis” Weekly Raid Rift quest. “Sea of Ladon” Daily Raid Rift quest. 10x from a Conquest win when looting Conquest Chest. The Faelight Sparkle appears in your Rift Loot Bag and then in your Quest Log item slots (press “l“), or Inventory if your Quest Log item slots are full. 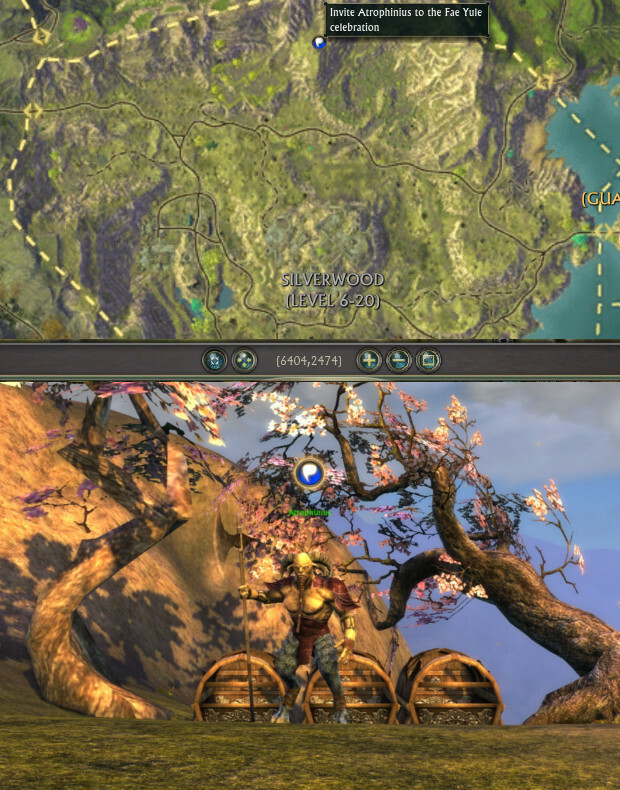 Note: For Conquest Wins, the Conquest Chest is located (for the winning faction) at the center of the map for Conquest: Stillmoor. 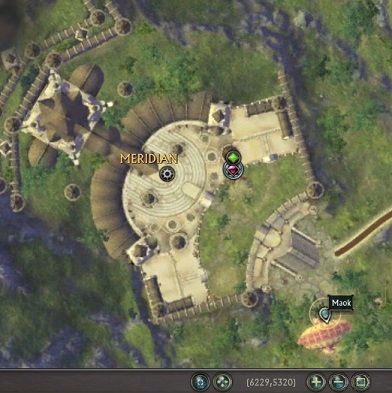 Tip: If you are going to zone event farm, consider using a Rift Event Tracker. Nightmare Tide zone events tend to be the most likely to be completed, and Unstable/Fae Yule Gift zone events will never fail, completing after lasting 30min. The Faelight Sparkle Returns quest is a one-time only quest that rewards your choice of either a Sparkling Shard of Wonder or a Reinforced Sparkling Shard of Wonder. These contain one random piece of Tier 3 raid armor or accessories from The Mind of Madness raid. The normal one has DPS/Heal gear whereas the Reinforced has Tank gear. There’s three quests available in Nightmare Tide zones for Fae Yule. Questgiver: Captain Jack Skyeling at /setwaypoint 6520 4140. Questgiver: Eg’nahwg at /setwaypoint 5512 6371. Questgiver: Charan at /setwaypoint 4040 6615. Note: You’re going to have to jump onto the bed and get right on top of the sparkle vfx to interact with it. The NPC you turn the quest into is random. Some are located in the Atragarian Well and others are located at Temple of Ranri. 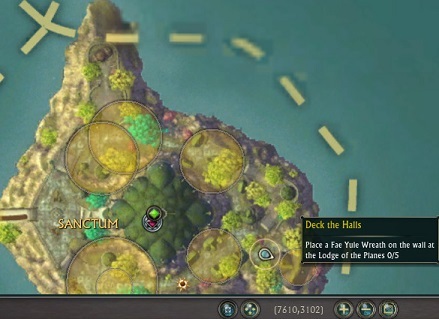 All Phase 1 questgivers are at the Fae Yule quest hub marked on the map in Sanctum/Meridian. A lot of the dailies re-appear in later phases, so this section lists a lot of quests compared to later phases. Objective: Invite Atrophinius to the Fae Yule celebration. Reward: Dark Ice Bell + 10 Dark Icicles. The “A Frosty Free-For-All” quest shares a random roster with the “Dashing Through the Snow” daily. Note: Players are immune for 7-8 seconds after they have turned into a snowball, so if your reactive is inactive, you’ll have to wait till their debuff drops. Objective: Collect Icebuds for Greatfather Frost’s Vaiyuu 0/10. This is a new quest for 2015. Simply click on the Icebud Flowers in Sanctum/Meridian to progress through this quest. Objective: You are tasked with Lighting the way for 3 Lost Travelers in Silverwood/Freemarch. You’ll notice large patches of black smoke in Silverwood/Freemarch in the areas indicated on the map. In the middle of those patches will be a Lost Traveler. Use the Quest Item by clicking on it and placing it near the Lost Travelers to complete this quest. You may need to wait a few seconds after placing the candle for the objective to tick forward. Objective: Throw Gifts quest item onto NPCs/Players with a cloud over their head. You’ll find ‘Humbug’ NPCs walking around in Sanctum and Meridian. Target them and use the Yulemother’s Gift quest item on them (appears in your quest tracker and quest window) to turn them into ‘Revelers’. They will usually disappear shortly after turning into a Reveler. Objective: Collect Stolen Gifts from Air rifts that grant experience 0/2. You must be mentored to a level close to or at the Air rift’s level to get the quest item. Right-click your portrait -> Select Ascended Level and then choose a level close to the mobs in the rift. Simply go to any wardstone/sourcewell you can find and press on the Nexus Infusion Ability next to the wardstone’s portrait. It doesn’t matter if the wardstone is already fully buffed to max level, and it doesn’t matter what level the wardstone is. This will complete the quest. 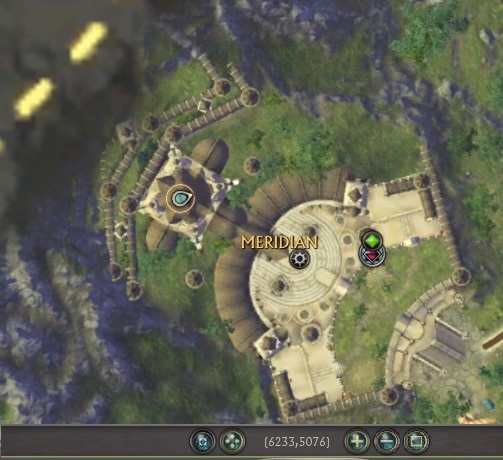 There’s a wardstone just outside Sanctum past the bridge, and one just below the steps at the entrance to Meridian. Note: You will need a Planar Charge to upgrade a wardstone. These are gained from closing Rifts, standing over destroyed Planar Crystals, using Aspect of the Ancients consumable or using Planar Attunement (Level 50+) abilities that grant Planar Charge. This is a simple quest to lead-up to the main Sledding quests. The large portal is in Sanctum/Meridian. You can’t miss it! This will port you to Iron Pine Peak where the Sledding quests are. 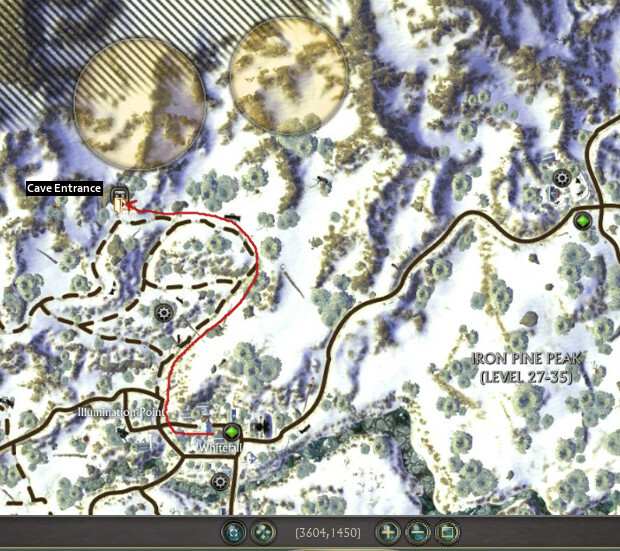 The “Sledding & Snowmen” quest is not a requirement for doing the Sledding repeatables in Iron Pine Peak so you can skip it if you want. Only rewards a small amount of experience. You can get to the top of the hill via standing in the blue jumppad. This will port you to the top of the hill where the sleds are (only active when you are on the sled quest). Speak to Merry to receive your reward. This is a Repeatable quest, but if you’re farming Unique Snowflakes – it is faster to close Rifts/destroy Invasions. 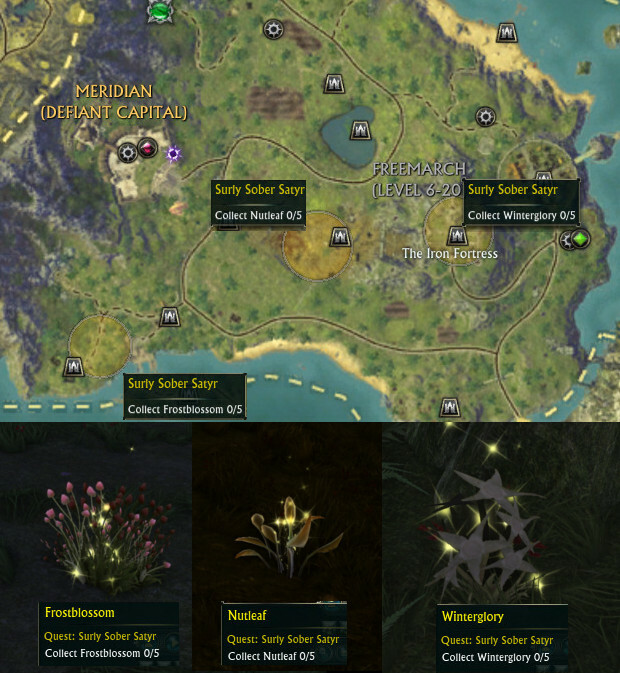 Phase 2 has a new story quest “Surly Sober Satyr” as well as some new dailies. Ask Greatfather Frost for some Wassail. Speak to Atrophinius at any Fae Yule quest hub to get this quest. Then talk to Greatfather Frost right next to Atrophinius. He’ll ask you to collect 5x Frostblossom, Nutleaf and Winterglory. “Baffling Crucia’s Winds” requires that you close Air rifts that grant experience (so you may need to mentor down to around the level of the rifts you are closing). It’s more or less the same as “Holiday Thievery!” but without the Stolen Gifts quest items. Objective: Kill rift creatures that grant experience 0/15. This quest involves killing rift creatures (Invasions, Rifts, Strongholds, Zone Events). It appears as part of a rotation (i.e. might not be available every day). You’ll need to mentor down to a level at or around the rift creatures you kill in order to get credit for the quest. Objective: Recover Stolen Gift Piles from the forces of Crucia 0/5. The Stolen Gift Piles are located in Iron Pine Peak, inside the Howling Caves to the north of Whitefall at /setwaypoint 3604 1450. Simply click on the piles inside the cave to progress the quest. About Respawns: The Stolen Gift Piles do not respawn on a timer. Instead, there are multiple spawn locations and when one Stolen Gift Pile is picked up, another will respawn at one of the empty locations. There’s no point in waiting around for one to spawn unless there are other players picking them up elsewhere. 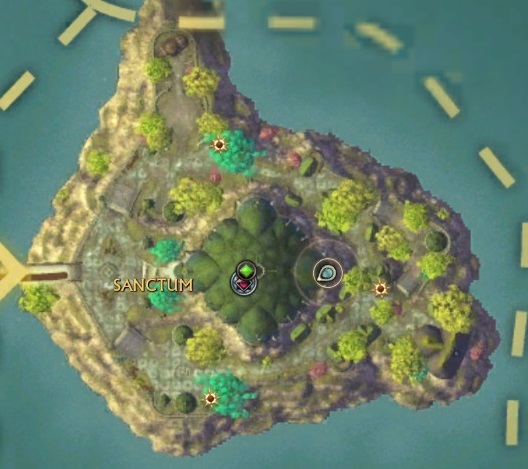 Rellop is located away from the main quest hubs in Sanctum and Meridian. Once you speak to Rellop and obtain the quest, there should be gifts that are interactable around him. Pick a gift up, then jump through the large Wreath portal. 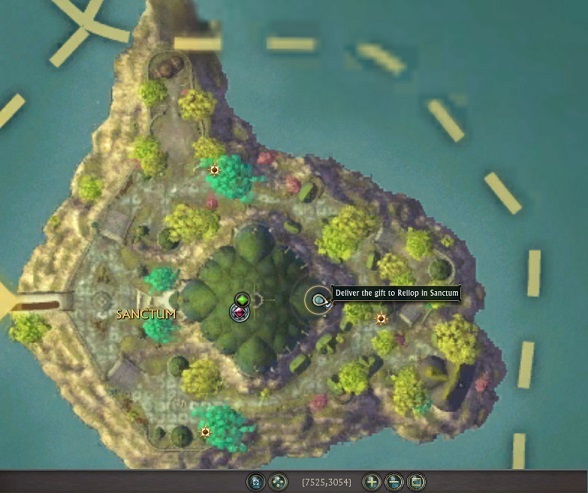 This will randomly teleport you to a location in Telara where there will be an NPC you can interact (has a speech bubble) to give the gift to. You should then be able to go through a Wreath Portal very close by to return to Rellop and collect your reward. The reward will then appear in your quest reward bag (the diamond icon). You can check out the main Fae Yule Guide here.